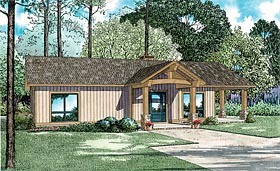 This new addition to our Little House Collection features a vaulted ceiling front covered porch and vaulted ceilings throughout with an open floor plan. The kitchen offers an eat at island bar with a nearby stone fireplace to provide warmth to the Great Room and Dining Room. 2 bedrooms are located on the left side of the house with a full bath and a laundry room and the spacious grilling porch off of the Great Room also features a vaulted ceiling. Question: What is the height of the vaulted ceiling in plan 82345?